1. Palazzo Abatellis which houses the excellent Carlo Scarpa intervention into the Galleria Regionale della Sicilia. Like his museum in Verona, the Castelvecchio, Scarpa takes the essence of ancient things and makes them new again. Too bad he is not alive today to make museum architects understand that they do not have to show off. 2. The Marionette Museum is splendid. The most complete number of examples I have ever seen from around the world. I did not have a chance to attend a show but I feel sure they are expert. 3. The Palermo Markets. I thought Santa Monica and the Embarcadero were good. But the Capo and the Ballero markets in Palermo put them in their place. I did not have a kitchen, but if you stay at the new Planeta Palermo just opened, you can have a kitchen. Otherwise, I suggest staying in the center at the BB22, extremely well located with very nice staff. 4. Dinner at Bisso Bistrot. Very reasonable, good, fun, centrally located. No reservations. 5. The Teatro Massimo. The third largest opera house after Paris and Vienna. After the Sahel opera it was hard to adjust to a Fernand Botero inspired circus themed Elisir d’Amore—which I also had seen recently in Vienna in a much frothier, saccharine production. Nevertheless no matter how you present it, this story of a faux magic potion which unites the lovers in the end really is showing its vintage. In the Teatro, there is little or no a/c so the ladies bring fans. I loved this, and the little red lights in each box (no actual raked seating, and a flat orchestra). After the little theaters of Orvieto and Spoleto, (I have only seen Fenice and Scala spaces not any operas) I am more convinced than ever that the future of opera, so endangered at home is in the smalls. When you exit onto the red carpeted stairs, there is no way not to recall The Godfather and for that alone it is worth the price of admission. The Prada Foundation in Venice, always a sumptuous experience has now become even more spectacular with the latest addition of Rem Koolhaas’s Torre, a multi story tower with installations that culminates in a restaurant modeled after the Four Seasons. It was closed when I was there so I cannot report on that, only that the spicy tuna sandwich at the original cafe was delicious and fast. 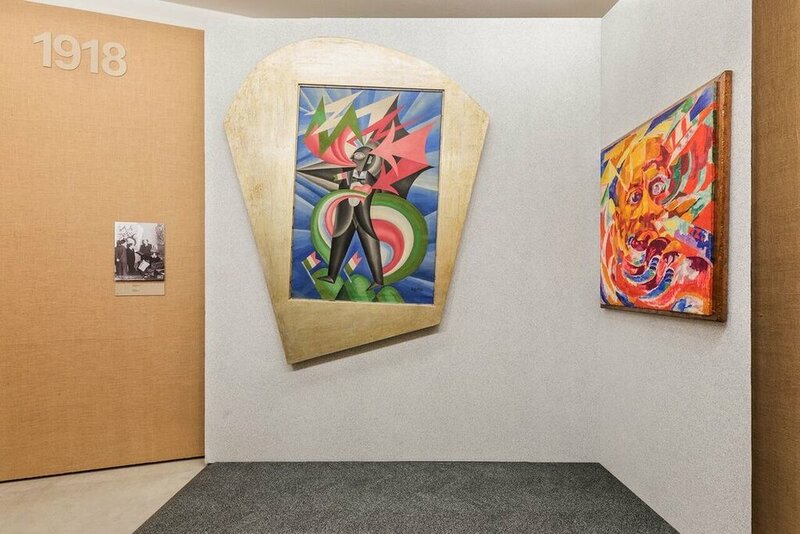 You need to be fast because there is much to see, especially now Post Zang Tumb Tuuum, a show that would not have been possible just a few years ago on the art of Italy pre and post WW2. It begins with the great Futurists (I can never have enough Boccocconi or Severni, though there are not the best examples here) and carries on through the Fascistic era. Now, buildings and paintings we once thought were edifici non grata are being newly rediscovered as examples of a certain style. Much of this art would have passed as Flea Market Art about a decade ago and it is still not the strongest period, but the curators have added vintage books, posters and ephemera and so we have an understanding of the motivations. I am a bit of a sucker for this stuff, even in its middlebrow incarnations, because in the aggregate there is an elegance that defies the often repressive or anti Semitic period during which it was made. Artists such as de Chirico had already been fingered, but there are many society painters and designers who must have been working with one eye closed. It’s a very large show which takes up many pavilions and I recommend it both as an artifact and a welcome addition to scholarship of the period which many of us having been avoiding. A local very knowledgeable friend who accompanied me on my visit said, “Who knows how long this all can last? “ By that she meant that retail luxury business is down worldwide and that Prada too had been affected. 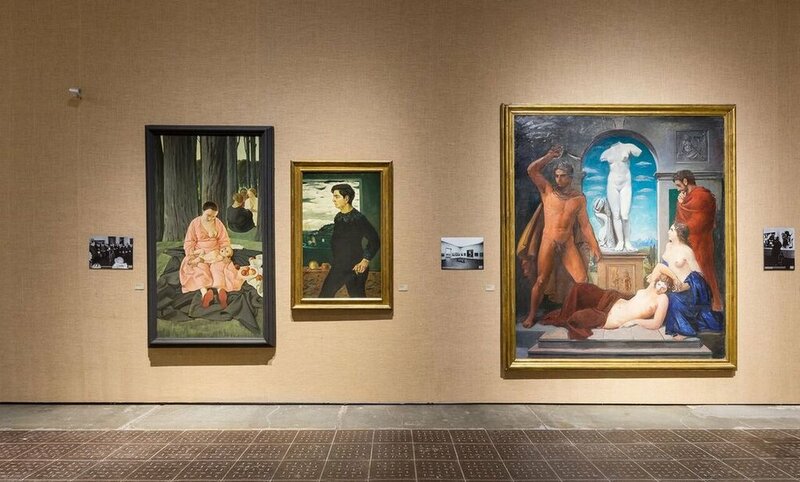 Though many luxury houses have contributed mightily to the arts, I would have to say that the scholarship at Prada is always top drawer and introduces me to work with an excellent historical perspective. At the Prada Foundation in Venice, an exhibition Machines À Penser has a title which is precisely the opposite of what one expects. Inside the always impeccably curated space is a show about philosophers and their hideaway huts. It is a testament to the value of escaping to do one's work, to the perennial Virginia Woolf wish for a Room of One's Own or as Dieter Roelstraete, the curator put it, "the enduring infatuation with fantasies of flight and the architecture of retreat"
Heidegger, Wittgenstein and Adorno the focus of the show had 'huts' that are still vaguely extant. The Palisades can be a good if isolating place with precious little spontaneity but that's probably what the philosophers were seeking. Refuge. Thinking about the relationship of thought to environment is omnipresent in my life and often confused with happiness. No, the exhibition is not about contentment but rather the mental space to do one's work. Again I was sorry that few women were included as surely women have longed to escape to think even perhaps more than men. Rachel Cusk's new book, Kudos, which I've just begun, has a scathing section on an Italian contessa's writers retreat only thinly disguised as is most of her work. Here the writer's are hardly able to work and instead sit staring at the beautiful walls or tapestries in a kind of mad desperation. One packs up his bag and leaves on the second day, another wishes she could but her suitcases are too heavy. The intellectuals in this exhibit are more bonded with their private retreats which depend on barebones cooking (women seem to be present for that part). Contemporary artists were asked to contribute to this theme. (Again: very few women) Alexander Kluge's film Cold is the Chain of God was far and away the most charming, an animation which included Napoleon's armies suffering in the cold, lots of beautiful snow and great wit. Situated behind a red brick facade with barely a number outside is the Fondazione Carriero, yet another private foundation begun by a wealthy founder. Tucked away inside a 14th-15th century private Milanese home, redone by Gae Aulenti (this much more successful than the Musee d'Orsay) originally for a bank, the quiet galleries are both hidden and free and open to the public. Still, this one is so tasteful as to be modest and for two more weeks, an elegant Sol Le Witt show curated by Rem Koolhaas and Francesco Stocchi is on view. Le Witt is mostly represented at Dia and at Mass Moca in huge installations where he loses me. Here, I found a measure of contemplation that worked. The Museo de Novecento is stuffed into a wonderfully fascistic building Palazzo dell'Arengario next to the Duomo, which I never recognize anymore, as it is white now instead of the black I remember. Tourists throng the square but Milan is still mostly free of American tourists (to their detriment. It is a wonderfully rich city). 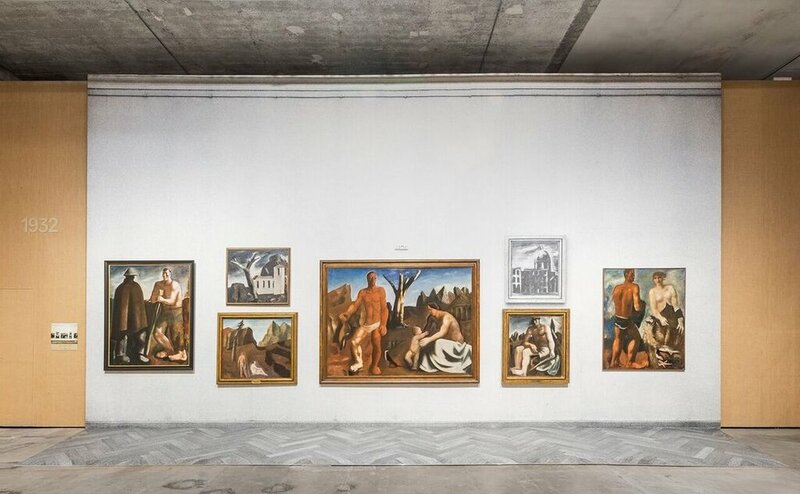 Though poorly retrofitted, the collection inspires a certain admiration: it is filled with Italian futurists and local artists, unknown to us, but worthy of attention. And at the top, the view of the Piazza is splendid.